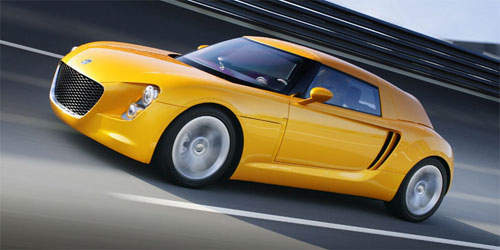 Ever thought a sports car that can do 0-100km/h in 6.3 seconds and achieve a top speed of 230kph can have a fuel consumption of 3.4 litres fuel per 100km? That’s exactly what the Volkswagen EcoRacer does. Volkswagen unveiled this concept at the 2005 Tokyo Motor Show. The Volkswagen EcoRacer only weighs 850kg, thanks to it’s carbon-fibre plastic body. Plus it’s aerodynamically designed for minimum air resistance. To save on weight, headlamps and rear brakelights are implemented using LED. The car’s roof is pretty flexible. In normal form, it’s a coupe. Take the roof off and it becomes as roadster. 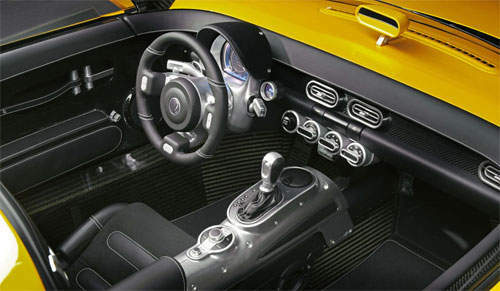 You can also replace the front windshield with a short upright panel to turn it into a track speedster. The Volkswagen EcoRacer is powered by a 1.5 litre TDI turbodiesel. The engine makes 250Nm of torque and and 136 horsepower. The engine is paired to a DSG double-clutch automated manual transmission. When you drive the car economically (don’t drag the gears, don’t speed, etc) you can achieve more than 1000km mileage from a 30 litre fuel tank. Amazing! The car rides on 175/55/R17 tyres on the front and 224/45/R17 tyres at the back. The cockpit is focused on the driver. Instead of a meter cluster, there is a TFT LCD panel which displays all the gauges and other information. This LCD panel moves together with the steering when you adjust the steering tilt angle. Speedometer and rev meter graphic displays can be set to either analog or digital form. There is even a built in shift light function, where a ring lights up around the rev meter once the desired shift point is reached in the rev ranges. Here’s the car with the top up. This is the coupe form. If you take the top out, it becomes a roadster. Here is the speedster mode, with the windshield switched to a wind deflector module. The deflector is designed to channel the slipstream over the cockpit. Previous Post: 2008 Vauxhall Vectra: Who needs drivers?